I should preface the following with the information that I live out in the country, my driveway is gravel and a 1/2 mile long. Took the machine out for the first test drive today, kind of exciting. Must have been in a rush as I had the outrigger air valve plumed backward to the switch and light so instead of down when the red light is on it was the opposite but not noticeable as they were locked down. So after an up and down the driveway run with them locked down (Red light on) it was time to ride free. They have a mechanical lock (toothed Bar) to keep them locked when parked or out of air pressure, I have a hand park brake lever on the right side with cables to the locking bars, when you push the lever down like you would releasing a park brake the mechanical locks are pulled away and disengage. Anyway, going down the driveway I planed to have the air switch in the out riggers down position (Red light on) then just put the P Brake lever down unlocking the mechanical locks but wheels would still be down with air pressure. The Brake lever didn't want to go down like it was loaded or something, I thought perhaps the outriggers were in a lower notch and some of the weight of the machine on the out rigger wheels, So with one hand on the handlebars and the other on the lever I gave it a good push and promptly started heading toward the Barb wire fence along the driveway, to make matters worse the ground drops off quite steep with 7ft. to entanglement and possible death. Out of what must now be instinct (35 years riding) I sharply counter steered back toward the driveway with thoughts of the front wheel skidding on the grass slope and still going in the fence where the sharp barbwire would have surely sawed my bare head off. As you probably know being as how I am writing this that didn't happen, the machine just jumped back up on the gravel driveway and I was riding free. After some adjustments back at the shop and switching the airlines on the spool valve I went for a few more rides. The Air cylinders are strong enough to hold the machine upright without the mechanical locks, something I wasn't sure about. It does handle kind of odd, doesn't feel like a regular motorcycle, it feels like it is a hammock and when you turn the bars the machine kind of swings underneath you. Steering is easy and takes very little pressure to turn the bars but it reacts very quickly which is odd on a 2 wheeler with a 110" wheelbase. Could someone inform me as to how their FF bikes feel at lower speeds? Do you get the feeling that the seat is swinging like a hammock? Submitted by DKE on 20-Apr-11 2:49pm. Thinking I should try less trail for better low speed handling. Right now the fork angle is 35 Deg. but the trailing arm (front swingarm) BMW design makes it hard to measure Trail. I did design the frame so I can move the trailinng arm pivot point, it is in the most forward or most Rake position now and think I will move it back .750"
Anyone have any experience on this? Submitted by andy tribble on 25-Apr-11 11:30pm. Glad you didn't crash the thing, Doug. 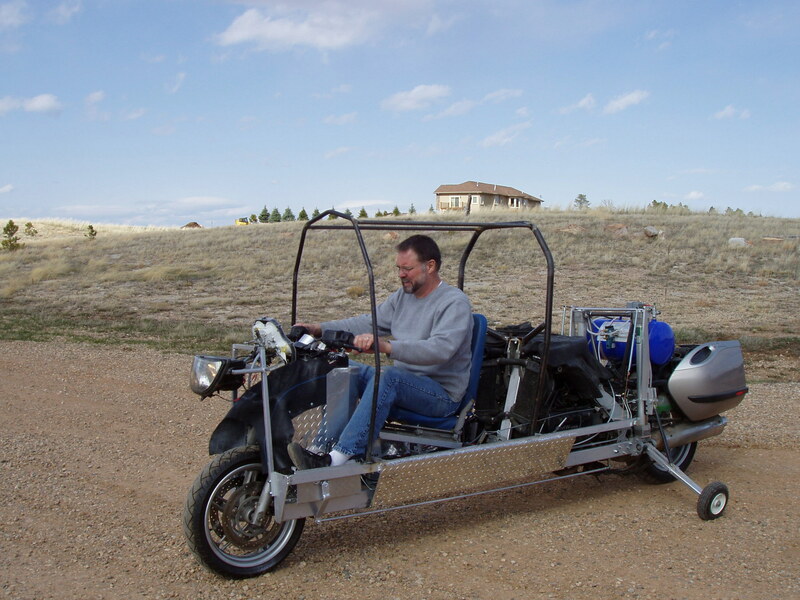 I have an ecomobile which is about the same length as your machine and also has BMW power and cycle parts. Couple of comments. The stage where you transition from wheels down to wheels up is the most difficult part of riding any 'Dalnik'. The bit from wheels up to wheels down is the second most difficult. First, you need to do something to your design so that when the side wheels go soft or lift, you have both hands on the handlebars. This means that your lock or pump must be controlled either by an easy hand switch (ecos have a left thumb switch) or a foot pedal. If you have a hand clutch on the left as it appears, and foot gear change, perhaps you could put your wheels deploying controls under the left foot as long as they don't get mixed up with the gear change. Second, about balancing. You need the dolly wheels set up so that when heading forwards there is just a tiny touch of lean one way or the other. Then ride the machine in a slight S movement so you get used to the idea of the lean going from right, to left, to in the middle. I would suggest going up and down your driveway practicing this without ever lifting the wheels. This will help you to learn the exact amount of steering pressure needed to take the weight off the wheels on either side. Once you have done this a few times, the next stage - with the wheels still down - is to try and hold it in the centre position so it is leaning neither to right nor left. With the wheels down it is impossible to do this for very long while travelling in a straight line, but again you will learn what it feels like. Now you are ready to go wheels up in a controlled way. You start out, use your S curve to get the weight off the side wheels, make sure that the steering is light, with no push either way, then flip the wheels up and take control. Some people (including myself) get all these stages right and then still fail to take control; their hands go limp on the steering and the machine falls over. What you have to do is imagine a fat black line directly under the machine, which is where a line down through the centre of gravity hits the road surface. Your job is to grab the front wheel and steer it so that it rides onto that black line. So if the machine starts to tip over to the right, you twist the forks to the right, the front wheel gets onto the line and crosses over it, the machine stands up and tips the other way... get this sequence right and you're balancing. It is very important for a beginner to get the steering light with no pressure either way before you lift up. if you lift the wheels while you are pushing the steering round it will do the most almighty lurch and probably go down. For example, imagine you are in a steady curve to the right with the wheels down. Because the machine is upright, not leaning, the weight is heavy on the left wheel and you are putting a load of force into the steering, pushing it round to the right. Now (by mistake) you unlock the wheels. The machine will immediately want to fall over to the left. What's more the steering, which you have been heavily pushing to the right, will suddenly go light and your pushing force will twist the front wheel even more to the right. What happens when we steer a two wheeler sharply to the right? Answer, it falls over to the left. So the two actions amplify each other and you have an uncontrollable fall to the left. That's why you need the steering neutral, unloaded, before you flip up. Having said it is very important for a beginner to get the steering unloaded, it is possible to for an experienced pilot with a few month's practice to flip up even when in a slight curve. I've seen it done and it's cool but a little scary. What happens is, the pilot knows which way the machine is going to fall when he puts the wheels up, so he jams the steering hard over just as he is flipping the wheels up, 'catches' the imminent drop and then carries on. However this is advanced stuff, don't do it yet. Submitted by bobwreford on 24-May-11 4:56pm. Yes you have described it perfectly Doug, a swinging hammock. It feels strange at first because you think it is so different to a normal motorbike it must be worse, yet because it is so comfortable and you are in control like flying a plane and you can see so easily without hurting your neck your brain soon accepts it. It is even different to a factory custom because we do not have the high rake which makes those bikes fall into the corners, especially at slow speeds. But the Zero to 15 mph is where you feel you might fall over, it feels unstable so we accelerate with committment off the line and then start 'flying'. I do not have stabilisers so I wear out my shoes faster as I drag them away from standstill and put them down like a goose when landing. Have hours of fun, I have been modifying mine for four years in tiny ways, I only keep a sports bike for pretending I am a grand prix rider, but 50 miles is long enough draped over that bike.